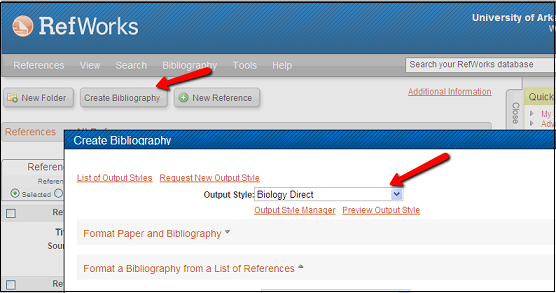 Click the Create Bibliography button. Under Output Style, select the appropriate style. Click Format a Bibliography from a List of References. Under File Type, select the file format you wish to create (Text, HTML, RTF (Rich Text), Word for Windows (2000 or later, or Word for Mac (98 or later) or OpenOffice (. odt). Under References to Include, select All References, My List or Specify a specific folder. Follow your browser's instructions for viewing the file and be sure to save the document to your hard disk before closing. Most important step: Be sure to proofread your bibliography before turning it in. RefWorks generates citations in a bibliography based on the output style guidelines in combination with the data in your RefWorks database. In some cases, the reference you have imported into your database may not have all the fields required by the output style you are using; be sure to check both the format and the content of the citations. It is easy to edit your word-processed reference list by hand after you have saved it to your hard drive or flash drive. 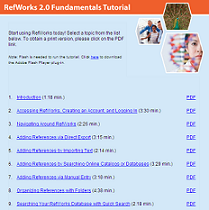 View the RefWorks video on creating a simple bibliography.